Our first leg of the trip was a stop over in Brunswick, Georgia. We were able to spend some long overdue time at Nan and Poppy's home. We felt right at home. The girls enjoyed Spot and Missy, their sweet dogs, and the beautiful harp. Stephanie was won over instantly with the plate of brownies, and Olivia had a special kinship with plucking the harp. Steve and I felt like we had just won a grand prize and it was a stay at a comfy bed and breakfast. It is so great to be loved and taken care of! Gary and Peg took the Friday to show us around and treat us so kindly. After breakfast we went to see where "spys are trained", so said the girls! We were limited in our picture taking, but I got a few in here and there. In Poppy's office where it is serious business! 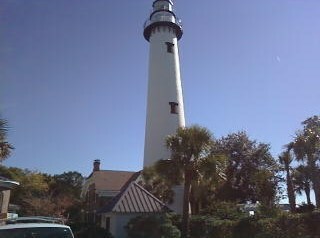 We headed out to St.Simons Island next. The beaches were very dark sanded and murky, but shells could be found! It was so windy and the tide was WAY out! 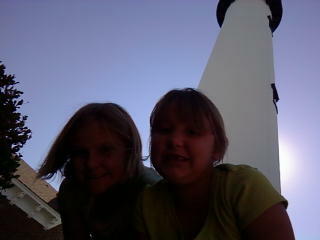 Climbing the Lighthouse was next! It was 129 stairs up and we did it! It was such a pretty sight. 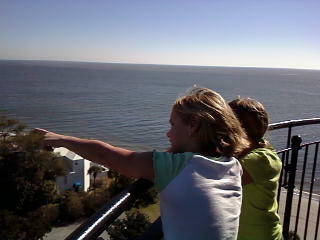 We could see across the inlet to Jekyll Island and there were some shrimp boats pullin' in too! Next stop was Hardeeville, SC. Then a whole day of driving to finally get to College Park, MD. My how time flies..unless you are a rock!